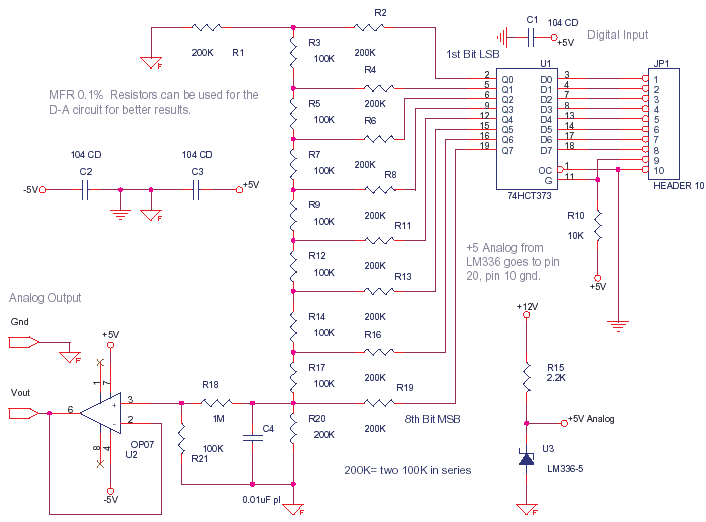 Analog Designs have to handle Linear Signals, Like 2.03 V and 35.3812 mA. Waveforms of all shapes from Straight Line DC Levels to the Jittery and Multi-Frequency Audio Waveforms. Digital Designs manage Digital Signals, Like 0 and 5V Logic levels. All families of digital Logic, have some Threshold Limits and Voltage windows to determine Data Voltage or Current levels over Noise; this (Analog) comparator like action evaluates a High or Low Logic state. There are only two states, one is Low and the Other is High. 0 and 1 Respectively. The Third State in the word like Tristate, is a floating high impedance for Bus sharing between devices. I would like to understand Mixed Circuit Designs as any circuit made of Valves, Discretes or Chips; in which both Analog signals and Digital Signals are Used. That would make an Analog Mux a Mixed Circuit, so also a PLL and a VCO. This is a R-2R Digital to Analog Converter, It converts a byte (8 bit) to a analog value. It has 256 levels including zero. This can be used to convert a byte sent from a microcontroller to a analog value like say 1.51 V. At full scale, when all 8 bits are high calibrate to give 2.55 V then ever bit increment is 0.01V, 10mV steps. Mixed Signal IC or ASIC are chips that are mainly Digital on the Core but have peripheral I/O within the chip to interface with the real world outside, over Analog Signals. Sensors and Actuators use signals in the analog language. The CPU with its Math Power, speaks Digital Words, its behavior thus can be patterned by a Software Program. RF Microwave and Communication Chips; Power Electronic PWM Integrated Circuits are Specialized Niche Mixed Sub-Domains. Therefore any Student of Robotics, Multimedia and Instrumentation, must be good at these Mixed Designs and a master of C Programming.